Zivo captures the Commentator at Belmont Park on May 31, a race part of a card highlighting New York-breds. 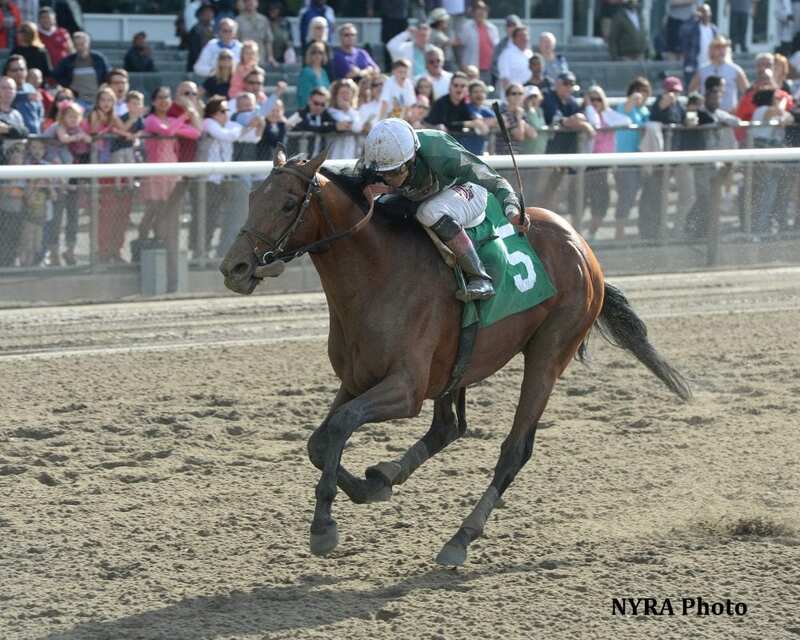 Zivo kicked into high gear through the final yards to capture the $200,000 Commentator by a neck over Big Business, bringing the stakes action on Saturday's Big Apple Showcase Day for New York-breds at Belmont Park to a thrilling conclusion. Trained by Chad Brown – who won last year's inaugural Commentator with Readtheprospectus – Zivo trailed by more than 10 lengths as Weekend Hideaway led through an opening quarter-mile in 22.69 seconds, with the half going in 45.29. Still far back as the field of 13 rounded the far turn, Zivo was tipped to the outside by jockey Jose Ortiz and he responded with a dramatic late run to get up in the last jump. “I saw [Big Business] was ahead by three lengths when I got clear, so I thought maybe I wouldn't get there, but I kept riding and he kept flying,” said Ortiz of Zivo, who is riding a five-race win streak including, victories in the Kings Point and Whodam at Aqueduct Racetrack. Ortiz won four races on the day's card, including three stakes. Zivo completed the mile in 1:34.11 and returned $4.70 as the 6-5 favorite. A 5-year-old son of True Direction owned by Thomas Coleman, Zivo has now won eight of his 14 career starts, with two seconds and four thirds. The winner's purse of $120,000 boosted his earnings to $507,300. Weekend Hideaway was third, followed by Prohibition, Crafty Dreamer, Awesome Vision, Readtheprospectus, Pinball, Smooth Bert, Moneyinyour Pocket, This Hard Land, Bernando, and Comandante. Heavily favored La Verdad won her third straight stakes in the $200,000 Critical Eye for fillies and mares, taking the lead entering the far turn and holding off a determined late flurry from Hot Stones to win by a half-length. It was the first start at a mile for the 4-year-old daughter of Yes It's True, who has won eight of her last nine starts, including the Grade 2 Distaff Handicap on April 19 and the Broadway on March 29, both at six furlongs at Aqueduct Racetrack. Sent off at 2-5, La Verdad returned $2.80 for a $2 win wager and extended her earnings to $526,700. She completed the mile in 1:34.30. Checking in third was Lady Gracenote, who was followed by Tahoe Tigress, Princess Mara, Miss Da Point, Macha, and Carameaway. Sunny Desert was scratched. Captain Serious registered a natural hat trick in the $125,000 Mike Lee for 3-year-olds with a front-running three-length score. Previously a winner of a maiden special weight on April 5 and an entry-level allowance on April 26 at Aqueduct Racetrack, Captain Serious went straight to the lead from post 8 and never looked back, leading by one length through fractions of 23.22 and 45.73, opening a four-length lead at the stretch call, and being geared down in the final sixteenth of a mile. Empire Dreams ran on from fifth to finish second, three-quarters of a length in front of Deceived, who edged John's Island and Eye Luv Lulu in a blanket finish for third. The final time for seven furlongs was 1:20.99, the quickest time at the distance so far during the 2014 Belmont spring/summer meet. Captain Serious, a homebred owned by Barry Schwartz, returned $4.80 as the 7-5 favorite. Captain Serious earned $75,000 for his Mike Lee win and has banked $142,000 so far in his career. Swell, Loki's Vengeance, and Freddie G completed the order of finish. Morning-line favorite Uncle Sigh and Double Gold were scratched. William Schettine's Isabelle successfully stepped up in class when she showed speed from the inside and held sway in the stretch to post a 1 ½-length victory over Storied Lady in the $125,000 Bouwerie for 3-year-old fillies. Facing winners for the first time off a 12 ½-length maiden win in an off-the-turf race on May 9, Isabelle quickly seized the lead under newly minted Hall of Famer Alex Solis, setting fractions of 22.21 seconds and 44.75 before opening to a three-length lead in the stretch. Storied Lady closed late on the outside, but Isabelle was never seriously threatened. Isabelle completed seven furlongs in 1:22.20 and returned $7 for a $2 win wager as the 5-2 second choice. Winning trainer Lisa Lewis lauded Solis. Isabelle is now 2-1-0 in four starts and has earned $131,700, including $75,000 for her Bouwerie win. Kharafa took the $125,000 Kingston by a length over his rival Lubash, reversing the decision from an optional claiming race a month earlier, to kick off the Big Apple Showcase Day stakes races on Saturday at Belmont Park. Kharafa, trained by Tim Hills for Paul Braverman and Timothy Pinch, was away alertly and took up a stalking position behind the pacesetting Street Game through an opening quarter-mile in 23.17 seconds and a half in 46.38. After three-quarters in 1:09.97, the son of Kitalpha still had plenty left in the tank, as he slipped away from the field at the head of the stretch and was able to hold the oncoming Lubash at bay. Ridden by Javier Castellano, Kharafa returned $6.80 on a $2 win wager and completed the mile in 1:32.85. His career bankroll now stands at $482,497. Mah Jong Maddnes earned her first career stakes victory with a front-running score in the $125,000 Mount Vernon, defeating the odds-on choice Effie Trinket. Mah Jong Maddnes, trained by John Morrison for Very Un Stable, broke on top and was throttled down early by jockey Taylor Rice, leading the field through an opening quarter-mile in 24.36 seconds and a half in 47.61 over a very firm Widener turf course. When the running began in earnest, the 5-year-old daughter of Freud kicked away from the field at the top of the stretch, and was able to hold off a late charge from Effie Trinket. Returning $13.20 on a $2 win bet, Mah Jong Maddnes completed the mile in 1:34.42 and increased her bankroll to $316,925. Runner-up Effie Trinket ran valiantly, missing by only a half-length on the wire for trainer Rick Violette. Lady's Lunar Luck finished third, edging Roses for Romney, Dreaming of Cara, and Frosty Way in a four-way photo. Frosty Bay and Miz Owell completed the order of finish. Joy Seeker and Stock Fund were scratched. This entry was posted in Racing and tagged belmont park, big apple showcase day, captain serious, Horse Racing, isabelle, kharafa, La Verdad, mah jong maddnes, New York-breds, nyra, Paulick Report, thoroughbred, zivo by Press Release. Bookmark the permalink.